To evaluate the ancillary revenue maturity level of airlines around the world, Diggintravel and Switchfly launched their first Global Ancillary Revenue Survey. The survey, which was originally presented at the 11th Ancillary Merchandising Conference in Mallorca, revealed how advanced upselling and cross-selling tactics among airlines are these days, as well as their biggest gaps. 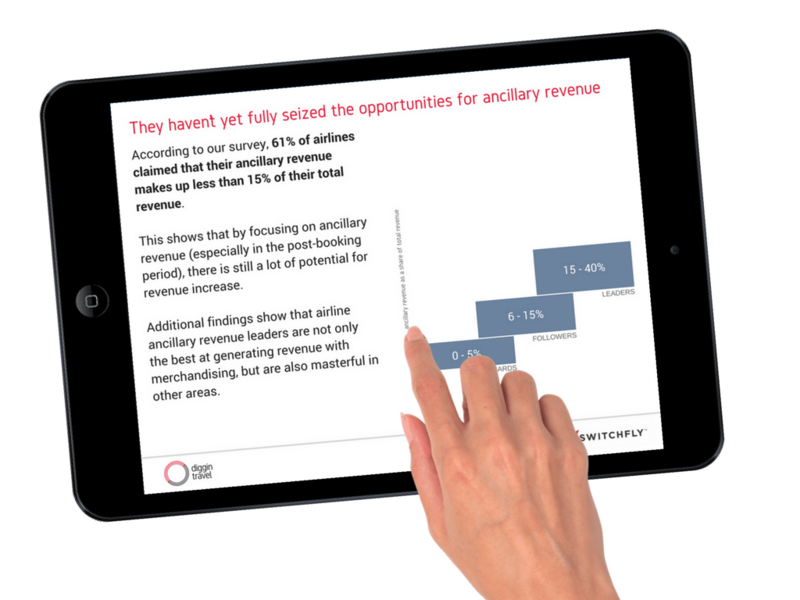 Afterwards, our survey analysis resulted in the Ancillary Revenue Framework – a powerful tool for airline professionals. The Ancillary Revenue Survey can help you determine at which level of ancillary revenue maturity you are right now, and which future steps to take to elevate your ancillary revenue practice. Twenty-three well-known airlines participated in the first Global Ancillary Revenue Survey. The participants were a mix of traditional flag carriers, low cost carriers (LCC) and hybrid carriers. Additionally, we tried to cover all sizes – smaller, medium size, and large airlines. Although the Global Ancillary Revenue Survey covers the complete customer decision journey and all stages of upselling and cross-selling opportunities, the main focus of this survey was the post-booking period. By focusing on this aspect, our survey was able to demonstrate that this important part of the customer decision journey still offers an opportunity for improvement. Among airlines, the post-booking period is sometimes referred to as the “dark period.” However, the most successful players in the airline industry recognize this period as an opportunity to try new ancillary upselling and cross-selling techniques. We termed airlines that seize the most opportunities in these four categories the Airline Ancillary Revenue Leaders. Airlines that manage to harvest only some of the opportunities and consequently create less ancillary revenue, we recognized as followers. Laggards is the expression we used to describe those with the biggest gaps and opportunity to improve. As an airline professional, you can study the results of the Ancillary Revenue Survey and compare your ancillary revenue practices to the ones proposed in the Ancillary Revenue Framework. This will provide you with an in-depth understanding of which level of ancillary revenue maturity you are at right now. Consequentially, you will learn at which areas require more innovation to get the most out of your ancillary strategy. In this way, the Ancillary Revenue Survey correlates with the Ancillary Revenue Framework. 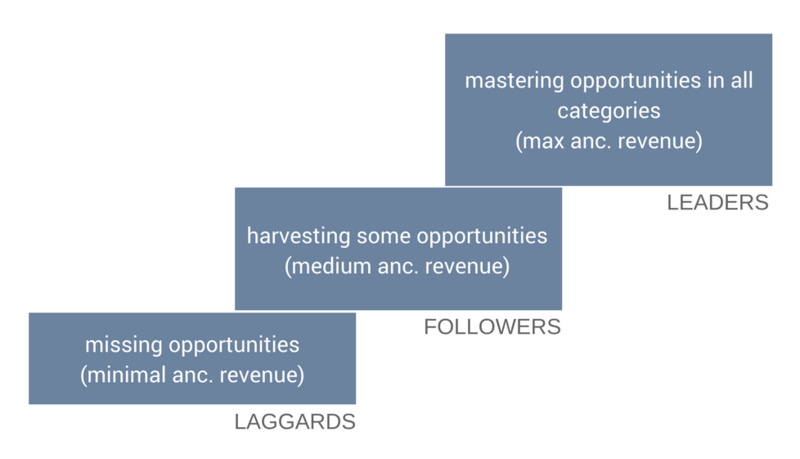 When you understand your airline’s stage of maturity in each area, you can use the Ancillary Revenue Framework to plan your next steps. The goal of this framework is to help advance your airline – regardless of your current stage. The Airline Ancillary Revenue Framework is applicable to all airlines. Click here to download the Airline Ancillary Revenue Framework. The hottest ecommerce trends – suitable for the airline industry – that you can prosper from if they are implemented promptly and wisely. Download 85 page white paper with 60+ charts and real examples from 38 airlines.